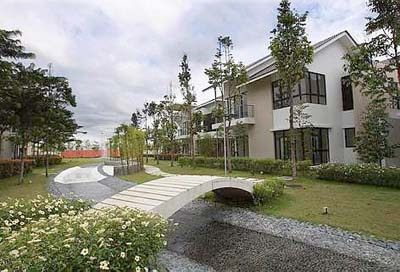 The newly completed Parkville Homes with its meandering artificial stream in Lake Edge, Puchong. PETALING JAYA: YTL Land & Development Bhd is offering semi-detached houses with their own private pool in its Lake Edge upmarket residential development in Puchong. Called the Waterville, the 50 units of homes are priced from RM1.59mil each. The design includes a lawn on the top floor and a long timber deck at the pool. YTL Land general manager Edward T. G. Lee said many people had registered their interest in the Waterville homes (currently in an advanced stage of construction) that would feature 3,800 sq ft built-up area with four bedrooms and a maid’s room. The standard lot size is 40ft x 85ft. Each bedroom comes with an en suite bathroom and the choice to shower in the outdoors. The master bedroom is located on the top floor while three bedrooms are on the first floor. The dry kitchen is in front while the living room is set at the rear of the house for privacy. “There are many Puchong residents who are looking to upgrade. They like staying in Puchong because of the many amenities and it is very difficult for them to uproot,” Lee said on a media tour of the gated and guarded community yesterday. He was confident the Waterville would be well received despite the current property market slowdown as there were few quality semi-detached houses in Puchong and that Lake Edge offered so much in terms of lifestyle living. Lake Edge features a collection of courtyard, terrace, semi-detached homes and bungalows. AMFIRST Real Estate Investment Trust (AmFIRST REIT), the country's oldest property trust, saw a 63 per cent increase in revenue to RM45.4 million for the first half ended September 30 2008. Net profit surged by 50 per cent to RM29.8 million from RM19.82 million a year ago. The growth was attributed mainly by profit from its newly-acquired units at The Summit Subang USJ, which started to contribute from April 1. There was also organic growth from positive rental reversion from tenancy renewals and tenant replacement, its manager Am ARA REIT Managers Sdn Bhd said in a statement yesterday. As at September 30 2008, the average occupancy rate of AmFIRST's total properties stood at 88.26 per cent. Am ARA chief executive officer Lim Yoon Peng said global uncertainties over real estate valuations, which developed during the period under review, have had an impact on investors' view on REIT stocks, reflected in depressed unit prices, and Malaysian REITS were not spared. "Nevertheless, we believe fundamentals of the Malaysian property market remain firm," he said. "REIT with good occupancy rates and strategies for development will be able to maintain steady dividend streams arising from the middle- to long-term nature of their tenancies, to the benefit of their unitholders," he added. Lim said Am ARA will continue to extract the best value out of the existing assets in the trust's portfolio as there is still room to further improve the earnings capacity and potential. AmFirst, listed in December 2006, is one of the larger commercial space REITs in Malaysia with six properties worth RM840 million in its portfolio. They are Bangunan AmBank Group, Menara AmBank, AmBank Group Leadership Centre, Menara Merais, Kelana Brem Towers and The Summit. AmFIRST aims to diversify its portfolio via investments in profit-producing real estate, primarily used for commercial, retail and office purposes. A distribution of 4.268 sen per unit, representing 100 per cent of AmFirst income after tax, has been declared. Based on AmFirst's market price of RM0.88 per unit (as at September 30), the distribution per unit represents an annualised yield of 9.7 per cent. The book closure and payments date of the distribution is November 21 and 28 respectively. The purchase by its Malaysian arm, ING Insurance Bhd, from Reco City Sdn Bhd is expected to be completed by year-end. Reco City is an affiliate of Singapore's GIC Real Estate Pte Ltd (GIC RE). Business Times had earlier reported that ING was a frontrunner to buy the 45-storey building, with total tenantable area of about 345,000 sq ft.
ING Insurance president and chief executive officer Datuk Dr Nirmala Menon said that an agreement to buy the property was entered into in September. "It is a calculated acquisition, which was made after we were satisfied with our professional consultants' due diligence reports, with relevant risk consideration and risk management done," she said. She added that apart from capital appreciation, the building is one of the most prominent office towers in the prime commercial area of Kuala Lumpur's Golden Triangle. It would also act as a hedge against inflation. "The company obtained approval from the Foreign Investment Committee (FIC) to acquire Menara Standard Chartered in September 2008. The purchase is scheduled to be completed before year-end," she added. Talks surfaced recently that ING Insurance may not go ahead with the deal as parent ING Groep NV had warned that it will likely post euro500 million (RM2.27 billion) in losses, when it announces its third quarter results next week. Last month, the Dutch government extended euro10 billion (RM45.3 billion) to ING to help reduce the financial services provider's debt equity ratio from 15 per cent to 10. Nirmala, however, said that ING Insurance will continue to seek prime properties in Malaysia for investment. "Our purchase of Menara Standard Chartered is our testament that ING Insurance is committed to long-term investments in the Malaysian market and we continuously seek prime investment opportunities including real estate opportunities. The total assets under (our) management currently stands at RM10 billion," she said, adding that investment is part of ING Insurance's portfolio diversification strategy for a secured and strong income stream. Menara Standard Chartered is over 90 per cent occupied. 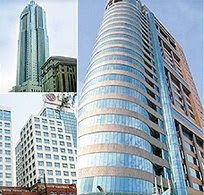 Its main tenant is Standard Chartered Bank Malaysia. GIC RE bought Menara Shahzan Insas in November 2001 for RM135 million. Following an extensive renovation, the building was renamed Menara Standard Chartered.